A natural masterpiece, hardwood flooring is considered by many to be among the finest floors available. Gorgeously authentic and long-lasting, hardwood flooring can be used to obtain all types of different looks. If properly maintained, your hardwood flooring will last for generations to enjoy, offering elegance and value to your grandchildren. Truly, the benefits of hardwood flooring are many. Your hardwood floor will add lots of dimension to your space, since it creates an illusion of added depth. Still, hardwood isn’t suitable for every room, and since it can be a serious investment in your property, it’s always a wise decision to research before you make a final commitment. Hardwood, because of its natural style, can add value to any home. It can be installed in rooms such as bedrooms and living rooms, and if properly maintained, hardwood can last for decades. For homes with children and pets, be sure to consider hardwood flooring that features a durable top layer. We do not recommend installing hardwood in areas with heavy foot traffic or moisture. So, hardwood isn't suitable for for kitchens, bathrooms, basements, and similar areas. Hardwood flooring truly offers up something for everyone - mainly because of the sheer number of wood species regularly being introduced to the flooring market. There are hardwood varieties to suit just about every homeowner- with hardwoods for every need and preference. Today’s consumers can browse weathered pines, warm maples, and rustic ash, as well as more unconventional hardwoods like lush mahogany, sustainable cork and bamboo, or rippled acacia. Hardwood flooring has been reinvented as the years go by, with new variations offering some viable solutions for modern dilemmas. Today’s consumers can choose between the tried-and-true solid hardwoods, as well as the newer alternative, engineered hardwood. Solid hardwood planks are made from solid wood: the original hardwood flooring. Solid hardwood is the most traditional option. If properly cared for, it has excellent staying power as it can be sanded and refinished over and over again. Solid hardwood does have its limits, however, as it can’t go below grade. It also doesn’t fare well in moist environments. Engineered hardwood planks are also made entirely of wood- but are formed in multiple layers. The end result is flooring directly in response to solid hardwood’s limitations: a denser, more stable floor that can withstand the occasional water, splashes, and spills. Yes, that means this type of hardwood will be right at home in your “man cave,” and other spots previously off-limits for hardwood fans. At Georgia Direct Carpet, you’ll find hundreds of beautiful hardwood options: both in our Richmond and Noblesville retail centers. 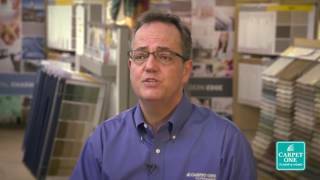 There, you’ll discover flooring options you and your family can feel great about- as well as friendly and knowledgeable team members to answer all your questions. Our hardwood experts will help you make the best choice for your specific setting. We have you covered with years of experience. Need some hardwood flooring ideas for your home setting? Prepare to be inspired.